Happy Tuesday and Happy Candlemas! As usual, our Tuesday started with oatmeal. Following some laundry, we began our school day with the story of the Presentation. 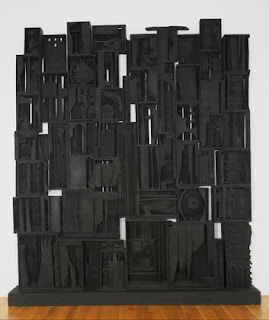 After, we worked together on a cooperative junk sculpture to go with our art this week, Louise Nevelson’s Sky Cathedral. Michael and Katie Grace started on their independent work while Daniel, Nicholas, and I had circle. It was groundhog time! We pretended to eat like groundhogs. And use our claws like groundhogs. We went back to the table and made a groundhog puppet. And later we even made a groundhog cave! Not much hibernating happened though. Nicholas worked through his boxes and Daniel puttered around while Katie Grace had her main lesson (Astronomy) and Michael had his (North American Geography and Mapmaking). In between, I started the potato bacon chowder for lunch and began a craft project– beanbags representing the different moon phases. 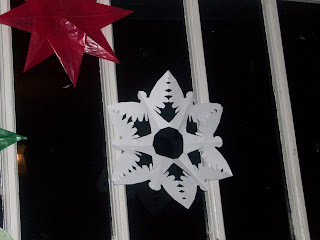 These go great with our Winter Lights circle from Seasons of Joy! Nicholas helped out with lunch (wearing a cape instead of an apron, of course!). We’re still cooking our way through John McCutcheon’s song “Soup” and are up to “potato soup”. After lunch we did our usual tidy and then had read aloud: The Sister’s Grimm. 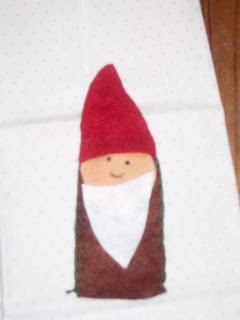 The Katie Grace was off to orchestra and I finished up my beanbags and also whipped up this little gnomie finger puppet for Nicholas. 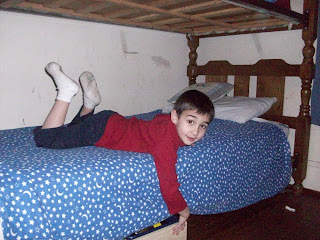 We had one more project to fit in before dinner– under the bed storage for Nicholas. 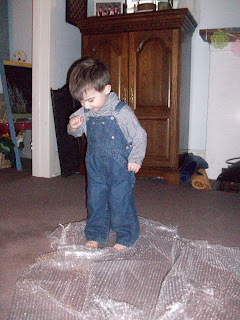 Daniel helped when he wasn’t dancing on the bubble wrap. Ignore the yucky bunk bed top. Usually I have a piece of fabric up there covering the slats, but Mr. Deconstructionist decided to liberate it for some project or other. Daddy took Katie Grace to ballet and we made dinner– corn fritterish pancakes shaped like a big round sun for Candlemas! Hope you had a wonderful day as well. I would love to hear about it! I’m thinking of doing a “Day in the Life” round up where people could document their days and post a link. Please let me know if you would be interested. We'd be interested, too! I love your post today (especially those bean bags…neat!). 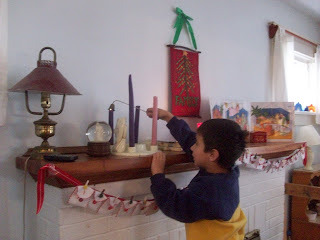 We also celebrated a bit for Candlemas and Groundhog's Day (see our blog post if you get a chance). I'd love to as well. I haven't done one in several years. Looking at your phases of the moon made me think of Emeril's sausage and pepper calzones (recipe on his website) which is an easy recipe that kids love. After waking up, a breakfast of oatmeal, and some laundry folding, we got started on our day. We’ve changed up our routine a bit, and are now doing our “together” stuff (Story of the World and any art/music/etc) first thing. This has made an amazing difference– we’re now pretty much finished by lunch except for read-aloud and orchestra, and if there is anything left, it’s stuff they can do independently. Cool beans. We started out with devotions. We’re learning about the names of Jesus. Today we read in the Bible that He is a “wonderful counselor”. We had an interesting discussion about what that means. Next, we read a little in the first chapter of The American Revolution for Kids. My little hippie babies totally dug the idea of protests and boycotts, and went on to make their own protest signs. Meanwhile, Daniel, Nicholas, and I had our winter woods circle time from Winter Seasons of Joy. Lots of fun, especially the part where we took turns hiding Mr. Squirrel’s seed and finding it so he would have food in the winter. Nicholas’s main lesson started with the story of The Elves and the Shoemaker. He helped tell it and sing the songs this time. We built a letter L from blocks and placed his church shoes on it. We also made a little brown mouse from beeswax. 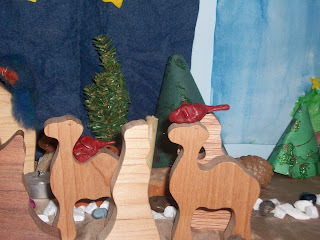 For inexplicable reasons, Nicholas decided the mice needed to hitch a ride on the Wise Men’s camels’ backs on the nature table. and kicked around his football. 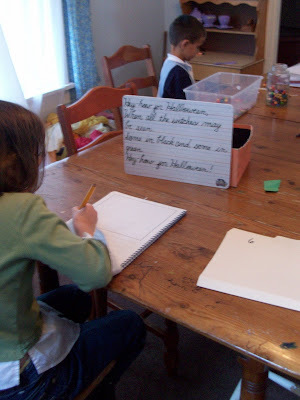 Katie Grace and Michael, meanwhile, were working through their workboxes and doing their independent work. 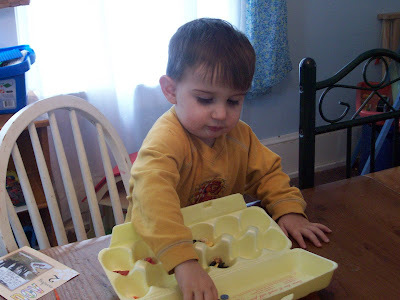 When Nicholas was finished having his time with me, he did his workboxes as well. Katie Grace reading Pilgrim’s Progress. 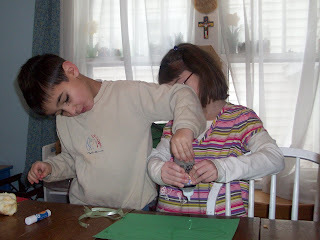 Katie Grace helping Nicholas use ribbon strips to make rectangles and squares. Nicholas and his mousie mask. Nicholas and Daniel playing shoemaker in front of the tent they built. Michael didn’t want his picture taken. and an Annunciation window transparency. Mary looks a but like a rocket ship about to blast off, LOL! Michael’s working on a botany main lesson, and did a beautiful painting of a sunflower. Unfortunately, the colors ran a bit. After lunch we read The Silver Chair and packed up the Christmas stuff. 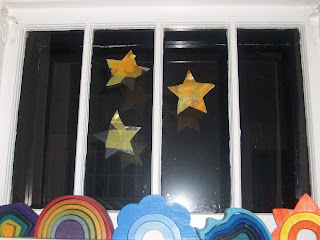 Then we made Epiphany stars. Obviously, it was a very busy day! Winter Seasons of Joy Giveaway! 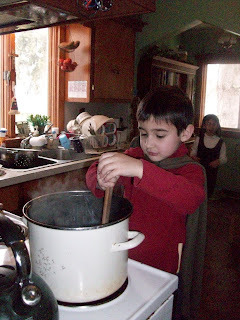 Smells like winter at our house… Bean soup! Thanks! I actually start out with my camera in mind but fizzle out towards the end of the day. It's like "We did this and this and this and this in the morning… and then a bunch of stuff happened in the afternoon, but it's all kind of fuzzy," LOL! I tried to change my kindergarten kid to "wonder boxes" as well, but he was offended. "I don't wonder; I do work!" I woke up to a grumpy boy who just wanted cuddled. No, not my husband– Daniel! 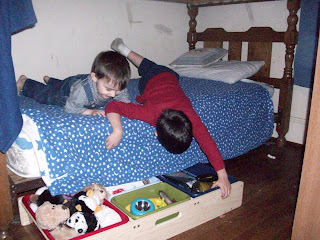 It was so sad, because I really needed to get out of bed and he kept saying “Mommy! I neeeeeeeeeeed you!” And really, what mother’s heart can resist that? Finally, Michael and Katie Grace piled into the bed (Nicholas was already there) and distracted him, and I was able to sneak downstairs. I made the breakfast muffins and got the ox tails on the stove to make broth. Michael unloaded the dish drainer and Katie Grace started on sorting the laundry. I also brewed some iced tea. When the muffins were done baking, I went up for my shower. While I was up there I also managed to put away my laundry and the two little boys laundry and straighten out our night table. I’m trying to do a tiny bit of our room each day. Back downstairs, breakfast was over and the laundry was all sorted. 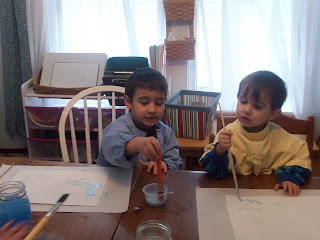 The kids worked on taking it up and I dressed Daniel and finished the dishes, and our day was off to a running start. First on the agenda, after devotions and morning prayer, was Story of the World. We worked on a map of the American Revolution and learned about the three branches of American government. I don’t know why this fascinated the kids, but it did. Well, the older two. 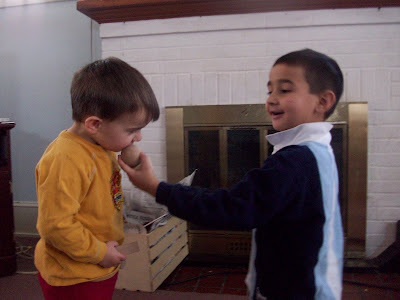 Daniel and Nicholas were in the living room playing with balls. Next,we worked on the first step of this beautiful Nativity painting. Everyone painted, even the littlest ones. Michael and Katie Grace got started on their independent work and Daniel and Nicholas and I had our Advent circle time. It was lovely. I love how the Advent wreath and the ever-increasing lighting of the candles is such a concrete representation of getting closer and closer to Christmas! I worked with Nicholas a little. We’re telling a lot of “joining stories,” rudimentary addition really, and he’s shocking me with how much he gets it. I could write a whole post on Nicholas, but he’s my most… immature? still incarnating? wild?… child of them all. He’s a smart kid, but very much in his own little world. 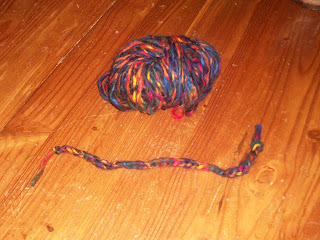 We’re doing fingerknitting with some nice chunky wool, and he finished the bookmark he’s making for Daddy for Christmas. He’s so proud! Nicholas went off to work on his own and it was time for Katie Grace’s main lesson– Joseph and dreams and learning to find averages, oh my! She drew beautiful illustrations of Joseph’s dream and the dream of the baker and the cupbearer. A quick snack of crackers and cheese, and it was back for Michael’s main lesson. We’re doing Moving Beyond the Page again, and again, I am underwhelmed. We’ll not be buying any of the units again. Today we talked about free verse and how a poet uses words to set the mood. In between main lessons, I sorted through coupons and made short work of my big pile o’ stuff. I also worked on our lunch stew and did a few more loads of laundry. Lunch was yummy. Much better than yesterday’s chemical dogs. We cleaned up a bit and then read another chapter in The Silver Chair. And then… we were finished. Michael had orchestra and I had intended to teach Katie Grace some piano, but I had a headache and elected to take a short nap instead. Tough to do with Daniel climbing all over me, but I managed. We’ve switched things up a bit, putting the group stuff in the morning rather than in the afternoon, and it’s made a huge difference. I hope you had a happy, peaceful day as well! Thanks for sharing this. 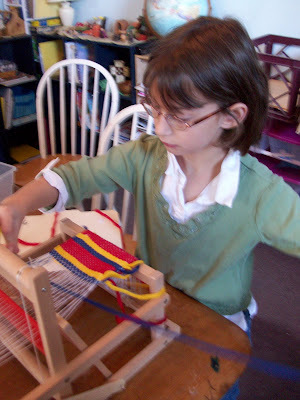 You make me think that homeschool 4 lil ones can be manageable. One day, maybe. Well, it's a bit of a juggling act and you have to find your groove, but I figure if the Duggar's can homeschool over a dozen, anything is possible! It’s Tuesday and we haven’t done this for while, so here we go! We were all up on time for a change. It was oatmeal for breakfast followed by chores, and we were starting our school day by 9 AM. Michael and Katie Grace got started on their independent work while the little boys and I had circle. We’re doing the Harvest circle time from Autumn Seasons of Joy. It was hard to get a good pictures as they rang their bells to celebrate the harvest! We’ve got our harvest in. Daniel’s favorite part of circle is “Oats, Peas, Beans, and Barley Grow”. I keep catching him singing it throughout the day! 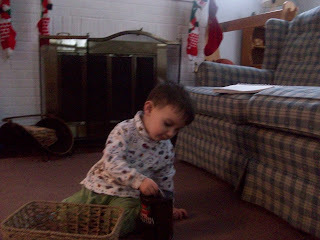 Daniel opened up his “surprise boxes”- his Playmobile train set from Grandma and Grandpa, a coffee can with a slit cut through the lid with juice can lids to put in, and a little wooden horse on wheels. Nicholas and I told the story of Jack and the Beanstalk again, and then worked on his main lesson book. Michael and Katie Grace, meanwhile, continued to work on their own. 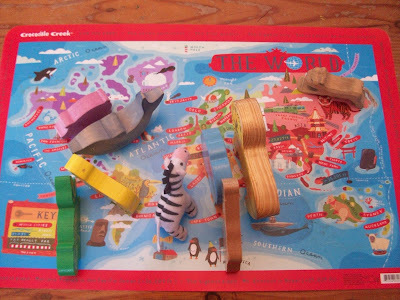 One of Katie Grace’s projects today was to place animals on a world map. but it’s hard when Daniel steals all the yellows! Katie Grace had her main lesson- farming- and we learned about the seasons cycle. 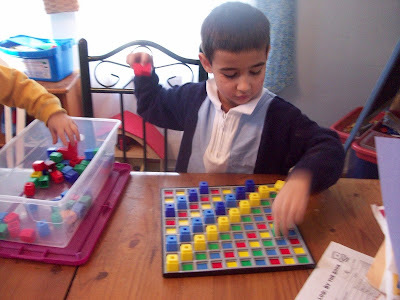 We also reviews the six times tables. By now it was time for a snack and a little break, and then it was time for Michael’s main lesson. Hark! now I hear them,–ding-dong, bell. Michael declined to be photographed today, but he did some very nice work! While Michael worked, Nicholas and Daniel did some more workboxes. Making ice cream comes from the geometric solids– yum! Clipping the “feathers” on the turkey– I’m not so much concerned with the color matching, although that’s an added bonus, but the clothespin clipping is great for his small motor skills. 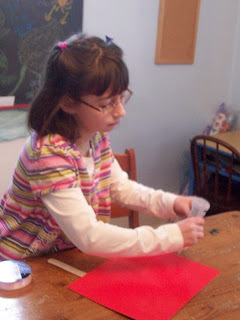 When Katie Grace was finished with her morning work, she got out her stamp and color set. Daniel liked one of Nicholas’s activities so much (placing buttons into egg carton sections labeled with that number) that he asked me to make him one! Michael went outside and I made lunch. After lunch, the kids cleaned up. It is so cool to finally have the kids be at an age where they can help out. We began our new read-aloud, Charlotte’s Web, and followed it up with some map work we missed yesterday. Then we read Story of the World. By now, it was time for Katie Grace to go to orchestra and time for us to end our school day. Wordless Wednesday: Ready to watch them play ball! Headache, headache, headache, and more headache. It was not a happy day. 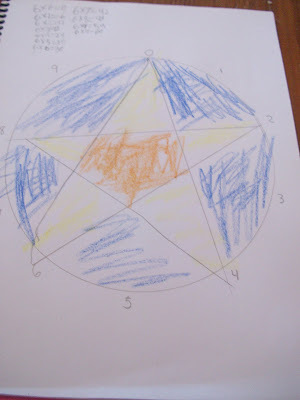 We started out with our autumn circle. Nicholas and Daniel had fun using the play silks to dance like autumn leaves in the wind while Katie Grace and Michael got started on their work. After showing Daniel what was in his three “surprise boxes” (wooden race track and cars, crayons and paper, and wooden bowling set), Nicholas and I settled in and I told him the story of The Magic Fish. He really seemed to love it. I drew a picture as I told it, and showed him the letter F in the body of the fish. 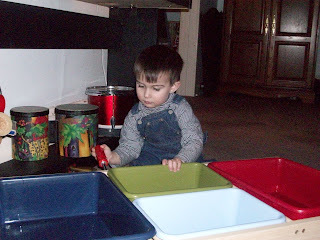 Nicholas got started on his workboxes. 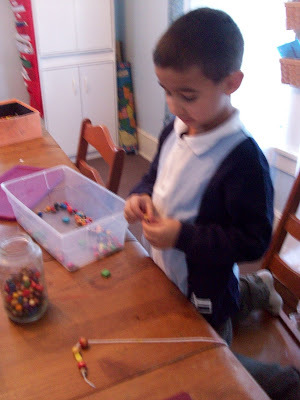 One of his projects was beading, and he was excited to find a “magic fish” bead in the box. The biggest thing I dislike about the workboxes is the plastic containers. We could do baskets, I suppose, if we had the money to buy 12 perfect baskets, but the plastic shoebox containers have lids, which is perfect for keeping tiny Daniel hands out of the day’s work. Ah well. As Nicholas carried on with his work, Katie Grace settled in with her lesson. She’s learning about Native Americans. It’s a little bit of history and a little bit of geography, but our main focus is on the stories and the arts. We started off learning about the Pomo Native Americans of California. After looking at pictures of the beautiful baskets made by Pomo people, Katie Grace started working on her own basket as I told her the legend of the creation of the moon and sun. She wrapped up her main lesson by writing out the story she had been told. When all the witches may be seen. Some in black and some in green. After a break for snack and to look at some art (Van Gogh’s Starry Night), it was time for Michael’s main lesson on folktales. After reviewing the stories he read in Cut from the Same Cloth, we talked about hyperbole and made a character web. By now, the headache was miserable, so I sent him off to read. Everyone chugged along at their work and I closed my eyes and tried to get rid of the headache. When I opened them again a half-hour later, Michael had made lunch for everyone– what a guy! After a little tidy and some outside play, we had read aloud– The Cat Who Went to Heaven— and then read about the closing of Japan in Story of the World. We only had time for a little map work before it was time to take Katie Grace over to Cochran Elementary for violin. Afterwards, everyone had some hard-earned screen time and I closed my eyes again and tried to beat this headache. I never cease to be amazed at what you do. Kudos to you and the kids. Hope your headache is gone by now! It's mostly gone, thank you! This morning, we all woke up bright and early. Everyone was up and dressed by 7 AM, which is a rarity for us. After I put laundry away, I had some paperwork to fill out for this morning’s eye doctor appointments. While I did that, the kids had breakfast and then got snacks and drinks for a long car ride. It was Katie Grace’s and Nicholas’s first eye exams today. They each got flagged at a vision screen that took place at co-op. We go to a pediatric ophthalmologist about an hour-and-a-half away. We need to see someone who is somewhat of a specialist for Michael, and I figure since we’re seeing her anyway, we may as well take the other kids there as well. On the way there, we listened to the audio book of The Lightning Thief. This is hot stuff in our house right now. Michael has read it, but it was the first time Katie Grace and Nicholas heard it. They loved it! Daniel fell asleep. Once we got there, I questioned my sanity of scheduling three appointments in a row. Katie Grace did great. She needs glasses, but only for board work and the like. Since we’re homeschooling, she won’t need them that often. Nicholas’s eyes are fine. He really loved “the robot eye” he got to look through at his appointment. After a yummy lunch at a Chinese food buffet, we headed over to Barnes and Noble to pick up the latest Percy Jackson book, The Last Olympian. While we were there, we also picked up A Night to Remember, which Chip thinks Michael will like. On the way out, we walked by a display of classic books. I saw Michael checking out an edition of Homer’s Odyssey. Michael asked if we could get it. What mama can resist a request like that? Michael finished half the new book on the way home. By the time we reached home, everyone needed to chill out a little, so we all spread out and had a little quiet time. Katie Grace helped me make dinner–beef stroganoff–and the boys helped their daddy fold and sort laundry. 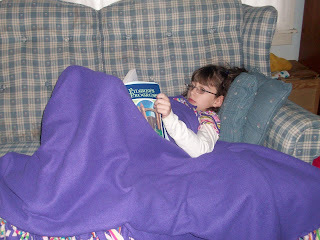 Health, language arts, geography, home economics– a full day of homeschooling! I don’t know whether to be proud or ashamed… First Fan Fiction! Knock wood, we’ve had a great past two weeks. Everything seems to be getting done–school, cooking, housework. It’s pretty awesome. It probably won’t last, but I’ll take it while we have it. After breakfast and morning chores, we started our day with devotions. Now that Christmas is over, we’ve put away Winter Saints and taken out Our 24 Family Ways. This week, we’re talking about initiative. 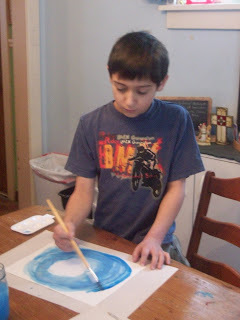 After devotions, Michael showed initiative and got to work on his independent stuff. Here he is reading Anne of Green Gables. He picked it. While he did this, Katie Grace and I had her main lesson. She’s working on two-digit addition with regrouping. Daniel likes to help teach at the board. Nicholas, meanwhile, was making a zoo at the other end of the table. When she was finished, we made a snack of that yummy popcorn we had to buy for Scouts, and listened to a Classics for Kids podcast (Schubert to be exact) and had a snack. Daniel was bummed he couldn’t have popcorn, but he had fun with the bowl when it was empty. 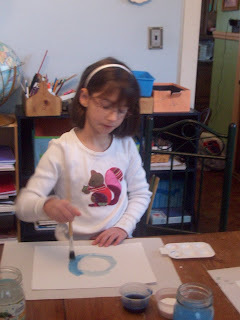 After a little break, Katie Grace worked on her independent work. She enjoyed painting her spelling words! Daniel got busy with the nesting blocks. Michael and I had his main lesson. We’re working on fractions, and today was finding the greatest common factor (which will lead into the greatest common denominator tomorrow). Tough stuff, but he did great. When Michael and I were finished, we did a quick art project, making Chinese lanterns from some watercolor paintings we did a few weeks ago. Michael doesn’t watercolor paint, so he decorated a sheet of paper instead. This ties in with China in Story of the World. Meanwhile, Daniel fed the babies cookies. The older kids finished their work and Michael practiced cello, and the little boys and I had circle. This week we’re exploring winter woods with the animals. The circle time is from Winter Seasons of Joy. We also did a little mousie rhyme from Wilma Ellersiek’s “Bringing Love, Bringing Joy” (translated by Kundry Willwerth). Then we made some icicles to add to the nature table. By now it was lunch time (Phew! Can you believe we get all that done in a morning?!? The kids get little breaks built in, but to fit everything in, I have to go non-stop!) After a leftovers lunch, the kids played living room basketball while I cleaned up and popped a cake in the oven to celebrate Nicholas’s baptismal anniversary. 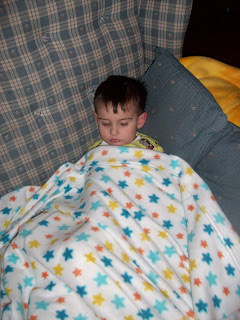 Next was read aloud–Holes by Louis Sacher– and while I read I nursed the baby to sleep. After I put him up, we read about Kublai Kahn and the Mongolian’s taking over China. Michael had a really quick Story of the World map activity, and then we made a litmus solution we’ll be using with our chemistry experiments tomorrow. Then we cleaned up, and that was the official end of school! Of course, the learning didn’t stop. Katie Grace and Nicholas joined me in some “My Fitness Coach” Wii, and Michael did some educational web surfing, and Katie Grace had ballet, and Michael had Scouts, and there were tons of stories to be read. All in all, a great day at the Morning Star Homeschool! Sadly, this will be a pictureless day in the life, not because there’s anything wrong with my camera, but because I couldn’t find it. DOH! Our official school day got off to a late start, not because we slept in (OK, Daniel and Nicholas slept in until 9, but the rest of us were up by 7) but because Michael and Katie Grace were engaged in a game of Monopoly. They were busy “learning” math and, more importantly, social skills. While they did that, I puttered around the kitchen a bit and made our family Advent/Christmas/Epiphany calendar. At 9:15, everyone was awake, dressed, fed, and changed, so we had morning prayer. We’ve put aside our morning devotions to follow the stories and readings in Winter Saints (see previous posts). Their format for morning prayer is just lovely. Afterwards, Michael got to work on his daily stuff (spelling, geography, math, and reading The Maiden of Northland: A Hero Tale of Finland) while I worked on Katie Grace’s main lesson. She is doing an Advent saints unit. Today she drew a picture of Rosa Parks, who we learned about yesterday. She said to me, “Mama, they can lock up a body, but they can’t lock up a person’s thoughts.” Smart girl. We also worked a little on measuring with inches and half-inches. It was a short main lesson, as I hadn’t really finished planning yet. I worked on that today. Next it was time for Michael’s main lesson–Norse Mythology. Not exactly Adventy, I know. We defined some vocab terms and reviewed some basic Viking facts, including some map work. 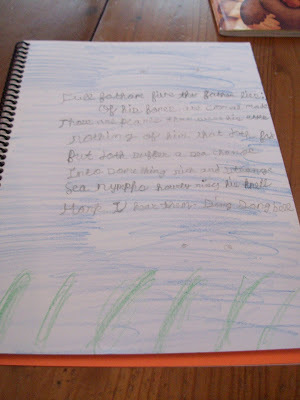 He did a creative writing exercise from the point of view of a Norseman leaving his homeland. Then he started reading “The Children of Odin.” He was really put out by the unfairness of the Norse gods, too. I mean it. He was ticked. It was kind of funny. Due to the late start, poor Nick didn’t get his time with me today. Which he was fine with, really. He’s in some sort of hunter-gatherer phase where he likes to hide up in his room and make piles of stuff under his sheets. Who knows? He’s cute, but odd. Lunch–potato soup topped with bacon and cheese, YUM!–followed by a 10-minute tidy, and then Catherine, Called Birdie. Then we read about the Vikings invading England–we have Vikings coming out of our ears–and then moved on to Latin. The saying of the week: Homo est animal rationale. I don’t know how to do accent marks, sorry. “Man is a rational animal.” We looked at vocabulary words that come from the Latin root word rationale. Then we looked at the genitive/possessive case. The Michael read a little Cicero and we discussed the idea that animals live solely in the moment, but people can make decisions based on the past and present. And this is why I love homeschooling– my fourth grader is reading freaking CICERO! Too cool. We were going to do science but again, no planning. So we cleaned up and called it an afternoon. Everyone had screen time while I did my planning and put the baby to bed. I hope you had a productive day as well! I seriously just love your blog! Thank you for doing your job so well. Oh, thank you so much! I think that’s one of the nicest comments I ever got. We’ve had two lovely days in a row. To be honest, I’m almost afraid to blog about it, in case I jinx it or something. We started the morning with devotions. Two weeks ago we talked about thankfulness. Last week we discussed contentedness. This week we’re discussing generosity, which flows nicely from the previous two weeks. After devotions, I got Michael set up with his independent work– working a few math problems, reading some of Boy by Raold Dahl, Daily Geography, Handwriting, Calculadder, practicing spelling words, and working on this “Map in a Month” thing we’re doing. It looks like a lot, but really, each thing there probably takes less than 5 minutes. Nicholas meanwhile was playing with some farm animal manipulatives, and then moved on to the gnomes. She rolled the die, and put the correct amount of coins in each column, and then she added up the total. She’s doing really well! After Katie Grace’s main lesson, we all went to the kitchen. I told the story of St. Martin while we made Martinmas horseshoe cookies. Yum! Katie Grace went outside to practice her spelling words–she chose to bounce a ball while spelling her words. And Nicholas was cracking nuts. He’s a very serious nutcracker. It’s actually pretty funny. Nicholas and Katie Grace both like to crack nuts, but not eat them. Michael likes to eat them, but not crack them. Everyone wins! Meanwhile, Michael had his main lesson on long division. I will say it was interrupted by a very fussy baby, so there were little breaks and gaps where Michael went off and read while I nursed the baby. But that’s life in a family, and one of the good parts of homeschooling, in my opinion. We are all learning together how to wait, how to be patient, how to bear one another’s burdens in love. We reviewed long division, both with and without remainders. Up until now, we had only done problems like 4 into 35, 8 into 66. Today we moved on to 2 in 45, etc. Divide, multiply, subtract, bring down… it’s amazing how quickly it comes back. We worked some problems on the board and then on the dry erase. 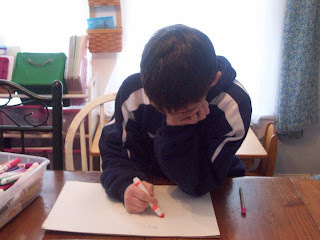 In his math journal–he doesn’t like “main lesson books” so much anymore; big boys of nine apparently have journals– he explained the concept of a remainder, and write a few real-life examples of when you would have a remainder. This was a jumping-off point for a writing idea, and he wrote a story about how the inventor of football used math to work out the logistics of planning the first game. Throughout this, Katie Grace came in and did her handwriting and geography. When Michael was done, we had a little art mini-lesson and drew fall trees. 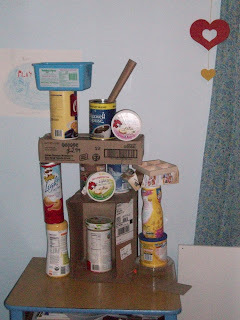 Art Projects for Kids is a great blog for these little projects! Michael was done for the morning, and so was Katie Grace, and now it was time for Nicholas (and Daniel!). 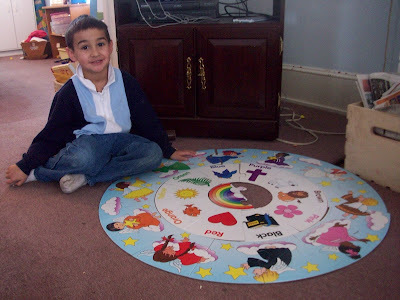 First we had circle time. We’re doing the Gnome Circle from Autumn Seasons of Joy. It’s so sweet to see Daniel starting to participate. He especially loves blowing out the candle! We said our nursery rhyme together (see sidebar) and acted it out. At the table, Nicholas did a page in his math book. Not Waldorf or even Waldorf-inspired, I know, but he wants to be like his big brother and sister! Then we warmed some beeswax while we read a story–The Apple Cake. We modeled beeswax gnomes for the nature table, and then played Dwarves and Dice, and then it was noon. My mornings are crazy packed. Sometimes I feel like a ball in a pinball machine, bouncing from kid to kid. It seems to be working though. Lunch, and then I had some Mothering stuff to take care of. Then we read a chapter of The Indian in the Cupboard, and followed this up with Latin. I drew a picture, and they told me the noun and adjective that described it. We also sang “Mica, Mica”– Twinkle, Twinkle Little Star. We read the beginning of the next chapter of Story of the World, and I decided the world wouldn’t end if we skipped science for the day. Daddy came home and Katie Grace and Nicholas had screen time (Webkinz for Kate, Little Bill for Nick) and I took Michael to orchestra. In the afternoon we made cookies for the church ladies to pack up and send to college students, tieing in nicely with Martinmas and our study of generosity. We also changed the nature table and made a lantern. All in all, a lovely day. I hope yours was lovely as well! I won’t go into the before-school routine. As usual, we got off to a late start. We started off with devotions. This week we’re talking about being thankful in all things. That’s a tough order! We started off with Katie Grace’s main lesson. She’s in the middle of a saints main lesson block. This morning, she narrated the story of St. Brigid to me and the illustrated it. She then copied an Irish saying “May God keep you safe beneath St. Brigid’s cloak.” She wrote some sentences about St. Brigid that ended with periods. We ended up her lesson cuddling up so she could read to me from Little Bear. Then she did a Calculadder. While Katie Grace did this, Michael made his paper mache head for Halloween. 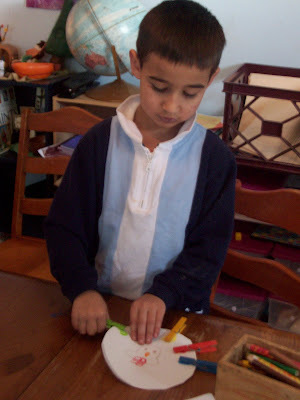 Did you know paper mache means “chewed paper” in French? Crazy. Nicholas, meanwhile, played with the baby. We had a quick chat about Sts. Jude and Simon, whose feast day is today. Right is right, even if everyone is against it. Wrong is wrong, even if everyone is for it. He followed this up with his independent work. He did his daily geography and read a few more chapters from Miracles on Maple Hill. He updated his reading log and did his Calculadder on his own. Katie Grace, meanwhile, did her daily geography on her own and practiced her spelling words. Then I set her up with a Calculadder, and then she was done with her independant work. 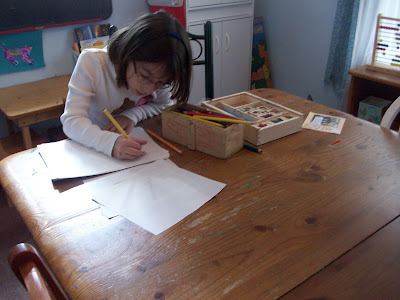 We did a quick art lesson–How to Draw a Cat— and then the big kids were done for the morning. That left me free to do Circle Time with Nicholas (Katie Grace and Daniel joined in as well). We started listening to an audiobook we downloaded from the library website–The Chocolate Touch. We had only intended to listen to the first two chapters, but the kids enjoyed it so much, we listened to eight! Before we knew it, Michael had to leave for orchestra. Daddy came home and put the baby down for a nap, and Katie Grace and Nicholas watched Between the Lions while I took Michael to orchestra. When I got back, we read Story of the World. Then I told a nature story about the leaf cycle. Both the older kids drew a picture for their main lesson books. Nicholas and I worked on a spider book we’re making. Then we cleaned up, and we were done for the day! I haven’t done one of these yet this year. We got off to a sluggish start this morning because two of boys stayed up watching the Eagles game. Woke up, put the diapers in the wash, tidied the kitchen. Was about to start breakfast when the baby woke up. Fell asleep again nursing the baby. Chip ended up making breakfast. After I showered, I tried on my new Enwrapture skirts, but then realized I had no tops to go with them. Changed. Got Chip to hang out the diapers while I started school with the kids. We are learning about Jackson Pollock for art appreciation. We said goodbye to Daddy. I forgot to do devotions–DOH!–and instead we started on math. Did Katie Grace’s lesson first (finding the missing addend) while Michael worked on geography and handwriting. Then Nicholas shoved his book at me, so I did a lesson with him while Michael and Katie Grace worked on their own. Then Michael and I corrected yesterday’s work and did today’s lesson (three and four digit subtraction with regrouping). Katie Grace was still working on her lesson, Nicholas was playing robot duplos, and Michael was doing his math on the sofa. Daniel was playing under the table, and it was at this point I spilled my tea. On his head. Changed Daniel. Cleaned the mess. Sniffed Daniel’s head, which now smelled like TAZO “Awake”. Thank goodness I drink my tea iced. Katie Grace was being really pokey with math. We worked on it together a bit while Michael finished his and Nicholas played “Count and Build.” I had index cards with numerals one through ten on them. 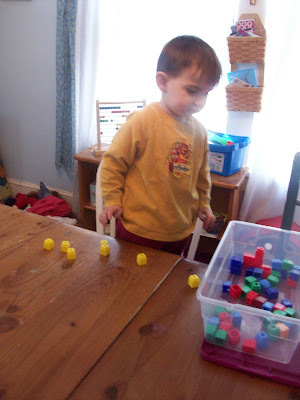 He would pull a card and then build something with that many blocks. Here’s ten! We got out some pretzels and ate them as the Language Arts Big Fun Hour began. First Michael did spelling while Katie Grace had a reading lesson. Then Michael decided to practice his spelling words by typing them on the computer while Katie Grace and I had spelling. Michael did some writing on his own while I worked with Katie Grace, and then Katie Grace went out front to write her spelling words with sidewalk chalk. At this point, everyone was caught up with handwriting, geography, math, spelling, writing, and reading. I’m not sure when, but at some point they both got their daily geography done and Michael read a chapter of Tuck Everlasting. So they went outside to play. Nicholas, Daniel, and I read a few stories and cuddled and did what passes for circle anymore– sang some songs and said some nursery rhymes. I was going to clean, but got a phone call from a friend about La Leche League/Homeschool Book Club, so instead I talked on the phone and nursed the baby to sleep. 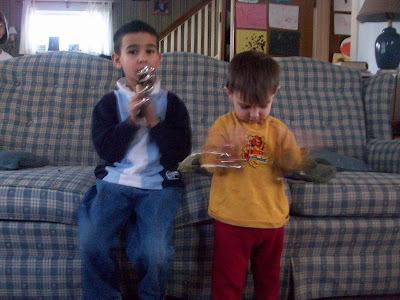 Hung up abruptly when Michael came in crying that he had broken his fingers. Put the baby upstairs, made lunch (tostadas), and then we cleaned up. Next we read a chapter from Augustine Came to Kent. I started Michael on grammar and then Katie Grace and I read some books about whales. By then it was almost 2:00 and time for orchestra. I dropped Michael off at the school and ran to the bank. Then we stopped at the education store my kids call “The Thomas Store” because of the awesome train table. Left with a little make-your-own board book and a book about cartooning for Michael. We picked Michael up and came home. We read a small section of Story of the World and then reviewed Latin. We didn’t have a whole lot of new stuff today. We ended with science– Michael finished drawing examples of pattern in nature in his main lesson book, and Katie Grace worked on the first page of her report on whales. The day was officially over, but the fun never stops. The kids helped me make some bread and some rolls, Daniel managed to put a lid on a Sigg bottle (I was shocked! 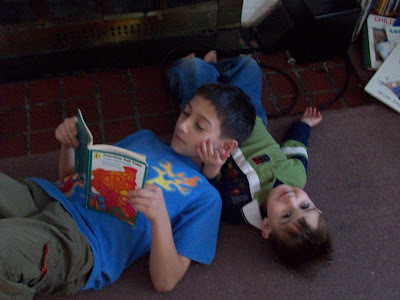 ), and Michael read two more chapters of Tuck Everlasting on his own. When Chip came home, he had just enough time to go apologize to the neighbors because Katie Grace, for reasons known only to her, decided to also practice her spelling words on their front walk, before taking her to ballet. Oh, and Daniel learned something new today too.